A - Michael Clayton is the finest corporate thriller to emerge from Hollywood since Michael Mann's The Insider. In some ways, Clayton is better, although on the surface its ambitions are more modest. It operates by the conventional genre rules, but in nearly all of its details it burrows deeper, finding gold where I expected only silver or even clay. It helps that the film boasts three compelling lead actors—George Clooney, Tilda Swinton, and Tom Wilkinson—all of whom offer perfectly tuned performances. Michael Clayton might be fiction, but the script and direction from newcomer Tony Gilroy are more forceful and psychologically intricate than that of any recent suit-and-tie thriller inspired by true events. 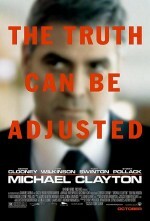 Clooney portrays Clayton, the "fixer" for Kenner, Bach & Leeden, a white-shoe Manhattan law firm. When a client or a firm member finds themselves in a potentially catastrophic situation, Clayton is dispatched to clean up the mess, or at least mitigate the damage. It is a job that requires an uncommon set of talents; "You have what everybody wants," senior partner Sydney Pollack exclaims, "You have a niche! " Yet Clayton's niche is also his prison. He is too valuable in his "janitorial" role to ever be promoted to partner. His trendy restaurant side venture—and possible financial escape hatch—has gone belly up, and a loan shark is lurking in the shadows. He has a gambling habit, and a young son who puts forth the lion's share of the effort in their relationship. As the film opens, there is a nocturnal crisis afoot at KBL, whose offices buzz with hundreds of lawyers. Clayton is called away from an underground poker game to Westchester County to assist a client in trouble. Something strange and shocking happens to him in the suburbs in the early morning, and this cues a flashback that plays out for the majority of the film. This reverse-mystery structure fits Michael Clayton comfortably. Director Gilroy returns often to the motif of a crisis that provides stimulus for reflection and reassessment. How did I come to this? What the hell am I doing here? The film rewinds and the mystery unravels, taking us on a groping journey through unseen malice and crippling doubt. We meet Karen Crowder (Swinton), the tightly wound in-house counsel for biotechnology giant—and Monsanto stand-in—U/North. Crowder has been working for six years with KBL attorney Arthur Edens (Wilkinson) to defend her company against one lawsuit. The plaintiffs claim that U/North's herbicides fatally poisoned their loved ones. During a deposition in Milwaukee, Edens begins ranting and declaring his love for a young female plaintiff, while proceeding to remove his clothes. Edens, it turns out, is a severe manic depressive who has been skipping his medication. Clayton is sent to retrieve him and assuage Crowder and U/North's justified alarm at this development. Edens confides to Clayton in fierce, sputtering speeches that he has had a revelation, that their corporate client is truthfully a murderous monster. He threatens to "switch sides," to ally with Anna Kaiserson, the young plaintiff with whom he professes a deep connection. In Edens' briefcase is an internal U/North memorandum containing a terrible secret. For her part, Crowder despairs for the billions in damages that are looming over her company, and for her own threatened position. She fears that she is up to her neck in a battle that is far beyond her abilities. The crisis escalates, all while Clayton's own life—his finances, his family, his frailties—threaten to spin out of control. There's a lot going on in Michael Clayton, both in terms of its story and its themes. It's a credit to Gilroy's formidable talent that it rarely feels cluttered. He mostly eschews exposition, preferring to take a loose, angular approach to the narrative. Characters speak in voice-over while we catch glimpses of them in flashback or flash-forward. In this tale of duplicitous attorneys and babbling madness, what Gilroy shows us is often equally or more significant than the empty words we hear. The director isn't afraid to let the superfluous details drift a bit out of focus. The minutiae of Clayton's family life and finances aren't really essential. Gilroy is working dramatic voodoo here, and that tends to be impervious to flowcharting. In a less interesting film—or one based on true events—the scientific details of U/North's toxic chemicals would be front-and-center. Here the contents of the secret memo are less vital than their seismic implications. In most thrillers, the MacGuffin is the prize in a chase or battle of wits. Gilroy instead lobs it as a Molotov cocktail, watching his characters scatter and trip over their own notions of decency, loyalty, and control. Client: This just...whatever you do...you have to contain this. Hitman: Contain? Client: Right. That's my question. Short of, whatever else...something more. What's the option for something along those lines? Hitman: You're talking about paper? The data? Client: That there's a more limited option, is what I'm asking... Something I'm not thinking of. Hitman: We deal in absolutes. Client: Okay. I understand. I do. Hitman: The materials, I'm not a lawyer, we try. We do what we can. Client: And the other way? Hitman: Is the other way. Gilroy's writing maintains this fascinating, elliptical approach throughout the film, rendering nearly every scene in unexpected and often moving ways. There is nothing contrived about his characters. They aren't naturalistic, but their reactions have a battered, slightly bewildered quality that is eminently believable. I had a strong impression that the three lead roles were written—or re-written—explicitly for Clooney, Swinton, and Wilkinson, and yet none of these estimable actors are walking familiar paths. Clooney exhibits flashes of his clipped, confident persona, but for much of the film he portrays a man drowning at the prime of his life. Swinton is in top form. She doesn't explore anything as rich as she did last year in Stephanie Daley, but she lends a crucial and uncharacteristic brittleness to Crowder. And Wilkinson, who is a fine actor with a hammy streak, turns it up to eleven here, to admittedly marvelous effect. His rambling, manic monologues are one part evangelical doom and one part New Age ecstasy. Gilroy makes the occasional poor choice in places, such as lingering a little too long on supposedly tense action sequences where we already know the outcome. The film is otherwise so densely layered that these moments—When will the explosives detonate?—feel all the more pedestrian. Michael Clayton is the sort of film that comes from out of nowhere. It's a stunning directorial debut from Gilroy, who previously has given no indication that he was capable of sculpting such mature, razor-sharp drama. The actors, particularly the increasingly impressive Clooney, deliver engrossing performances that heighten the script's fearsome power. Is it possible that the guy who wrote The Devil's Advocate transmuted into the next David Mamet while no one was watching?